New York, NY Broadway Construction Group (BCG) has launched its interiors division. 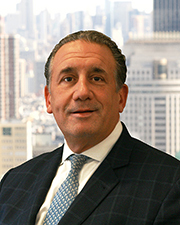 Under the leadership of president Everard Martin and managing director Joseph Candella, who has been hired to lead the firm’s interior efforts, the new division will manage interior build-outs, overseeing construction work for corporate, retail, hospitality, residential and institutional facilities across the NY metropolitan area. Candella brings to BCG more than 30 years of diversified construction management experience with some of the city’s leading general contractors, including JRM Construction and Vanguard Construction. Over the course of his career, he has worked with many notable clients – including Regus, Brickman, CBRE and Westbrook Properties –– and developed a strong expertise in interiors work, with an eye for detail, an expert understanding of the entire construction process, and in-depth knowledge of interior build-outs. In his new role at BCG, Candella will leverage his strong relationships with landlord, corporate and design professionals to grow the firm’s interiors division and expand the scope of services BCG offers. The addition of interior build-outs to BCG’s already broad scope of services will enable the firm to be a full-service construction manager whose clients can benefit from BCG’s resources, unmatched efficiency and price discount opportunities. For BCG, this is the most recent in a series of corporate announcements and expansions since the firm was established in 2013. In January 2017, BCG merged with Zephyr Construction, a Brooklyn-based construction management firm, led by industry veteran Joe Aiello, which bolstered the expertise and experience of BCG’s executive team. Earlier this year, BCG promoted Everard Martin to president with the goal of growing the company, expanding the company’s client base, and enhancing the quality of its construction work. With seasoned industry professionals including Martin, Aiello, Candella and Stefano Modugno, members of BCG’s executive team have been instrumental in the completion of some of the region’s most significant interior build-outs, including JPMorgan’s Park Avenue headquarters, the lobby upgrade at 148 Madison Ave and tenant projects at Westbrook’s 1375 Broadway.